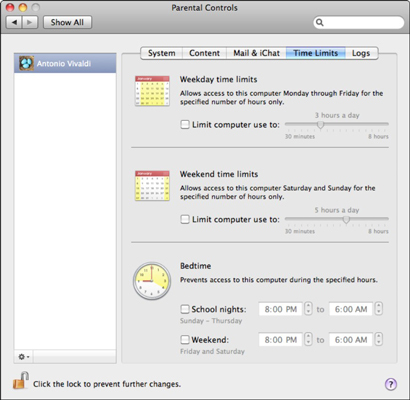 Setting Mac OS X Snow Leopard’s parental controls helps you restrict certain content that you deem inappropriate for children, but the controls don’t stop there. You can set time limits and even have Mac create logs that show where different system users have been. All these parental control options are designed to make your children’s online life safer. Open the System Preferences pane and click the Accounts icon. Click the account that you want to monitor and/or control in the list. Click the Open Parental Controls button. Click the Enable Parental Controls button and click the Lock icon in the lower-left corner to confirm your access (if necessary). You can restrict access to many functions within a Standard account. System: These settings affect what the user can do within Snow Leopard as well as what the Finder itself looks like to that user. Try to Limit Access: You can allow Safari to automatically block Web sites it deems adult. To specify particular sites to allow or deny, click the Customize button. Allow Access to Only These Websites: To add a Web site, click the Add button (which bears a plus sign). Snow Leopard prompts you for a title and the Web site address. Mail & iChat: Specify Apple Mail and iChat messaging addresses that this user can communicate with. To recieve notification if the user is attempting to send an e-mail to someone not in the list, click the Send Permission Requests To check box and type your e-mail address in the text box. Time Limits: You can limit by usage per weekday and weekend day, and set a bedtime computer curfew time for both weekdays and weekend days. Limit a user’s computer usage. Logs: Snow Leopard keeps logs that track where a user goes on the Internet, which applications they launch, and the contents of any iChat conversations. From this central pane, you can monitor all the logs for a particular account. Note that these logs are enabled or disabled from other locations within Snow Leopard. For example, the log showing the Web sites visited and blocked is enabled from Content, whereas the applications log is enabled when on the System pane. 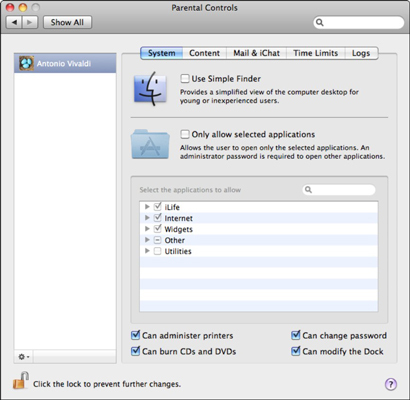 iChat logging is turned on from the Preferences dialog within the iChat application. You can always tell whether an account has been assigned Parental Controls because the account description changes from Standard to Managed in the Accounts list.